First, there was a rumor that Turok: Dinosaur Hunter was being remade. 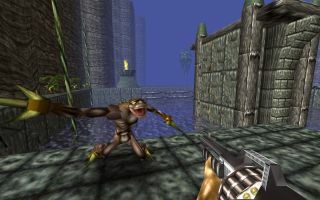 Then came confirmation that Turok and Turok 2: Seeds of Evil are being remastered for modern PCs, which included a half-dozen-ish screens showcasing the work in progress. Today, the wheel of dinosaur-shooting excitement turned even further with the release of—you guessed it—more screens. Back to the matter at hand, the screens come on the heels of a Facebook message, posted yesterday, that probably doesn't carry any particular significance, but sounds like it might. "It's come to our attention that some of you want updates on Turok!" the studio wrote. "Should we post some screen shots? Announce the release date? Unveil the trailer? Is it finally time to hunt some Dinosaurs?" Is it possible that a date or trailer of some sort is on the cusp of being revealed? I mean, sure, obviously it's possible, but is it likely? I've dropped a line to Night Dive to see if anyone there has anything more to say about it, and I'll let you know if they do.